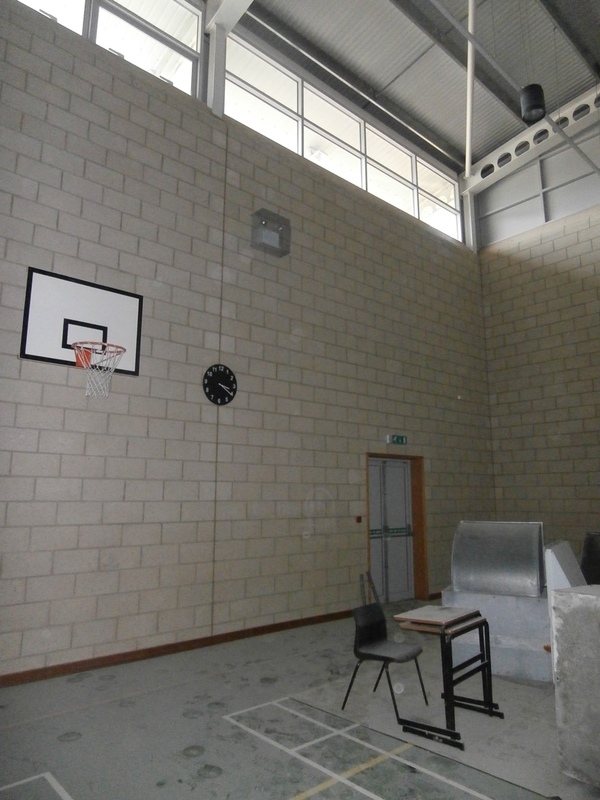 How many bricks are there in the Sports Hall? It was a game some staff used to play in the summer at exam invigilation time. I didn’t. Numbers have never been my thing. But if one of my ex-colleagues reading this remembers, perhaps they could tell us via a Comment. I know a post on the Sports Hall should probably be focusing on PE, but, as an English teacher, I spent most of my time there invigilating. 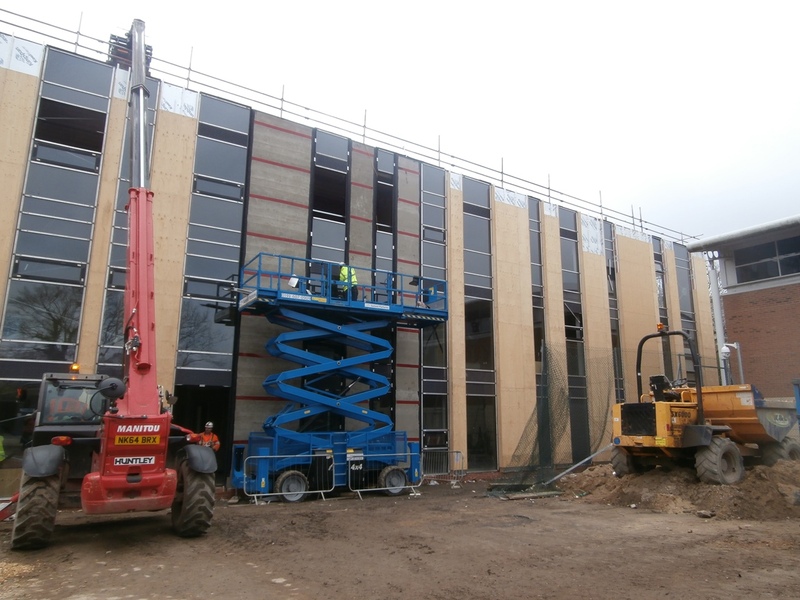 The Sports Hall set out for the external exams in July 2014. 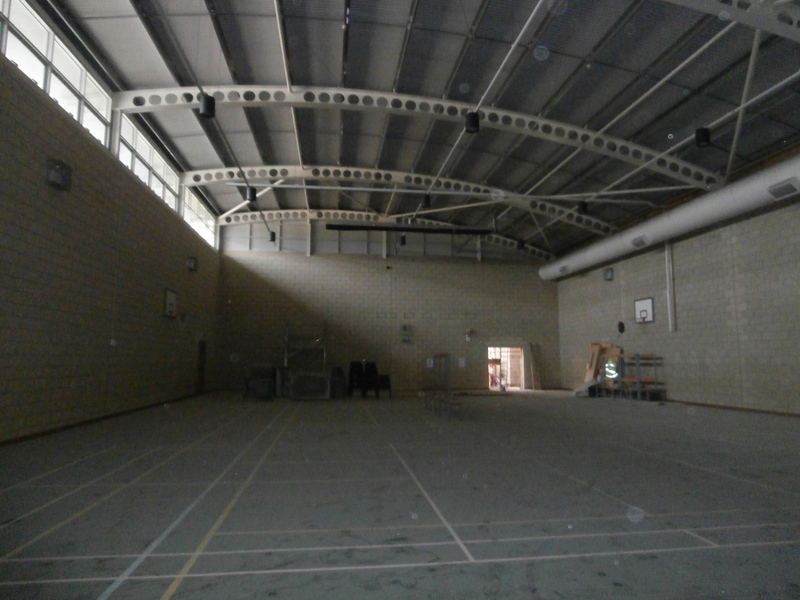 Up until April 6th, the Sports Hall was the only place on the main site I hadn’t visited with my camera. This wasn’t just because it wasn’t my natural domain. 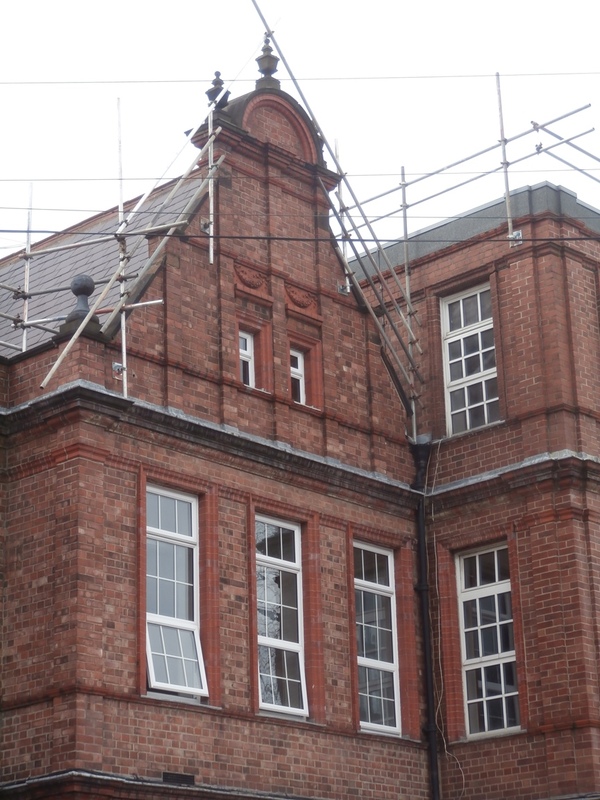 As the building is to be retained as part of the new school, for a long while it remained untouched, a safe storage space. 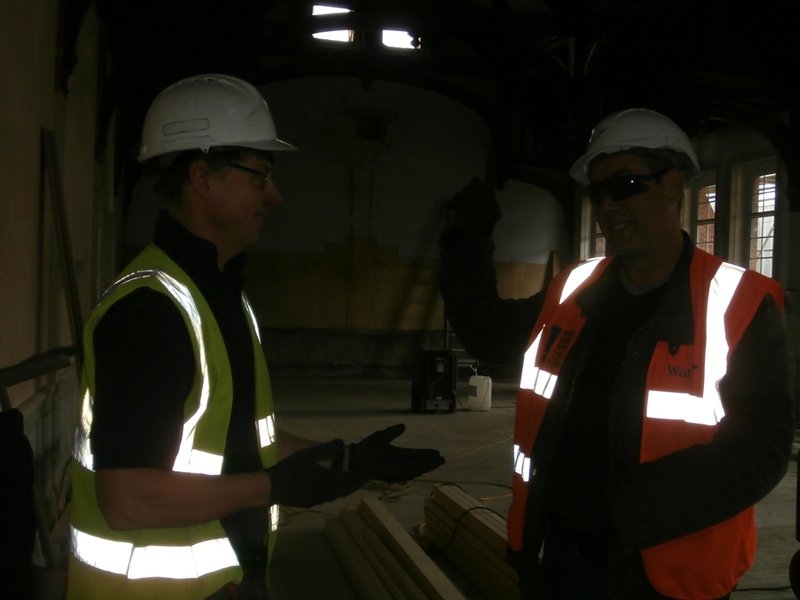 However, learning that Wates were working on it now, since Peter was needed on the fork-lift again, Eddie took me there today. Eddie leads the way to the Sports Hall today. 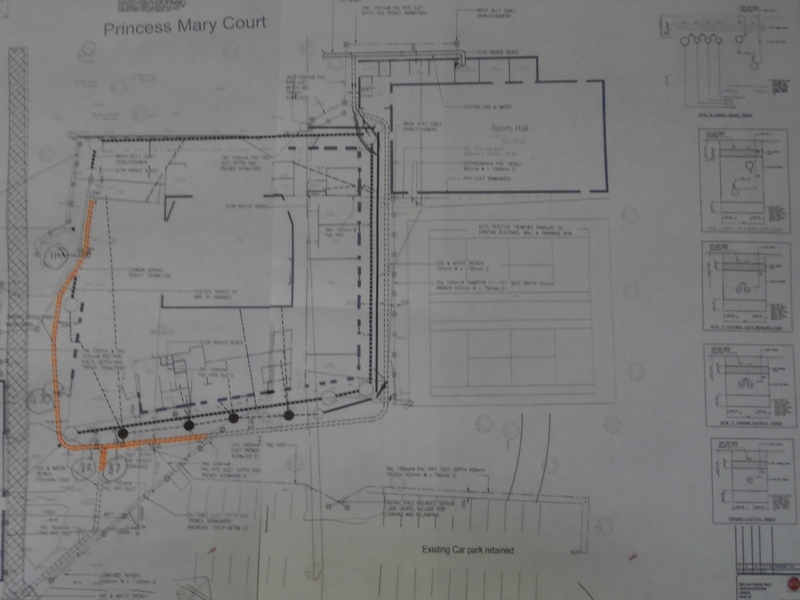 As can be seen from the plans, to allow optimum space for the new build, only a narrow alleyway now leads to the Sports Hall entrance. 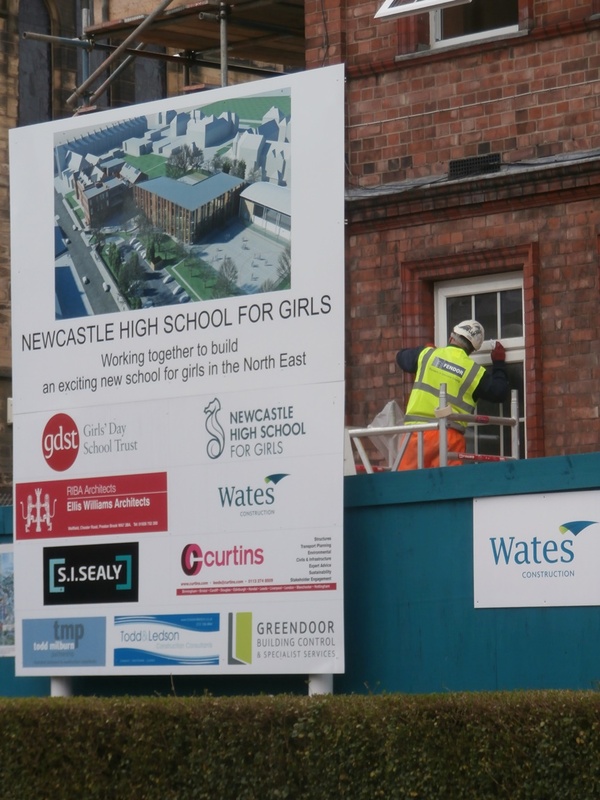 Wates’ plans for the new building including the Sports Hall. 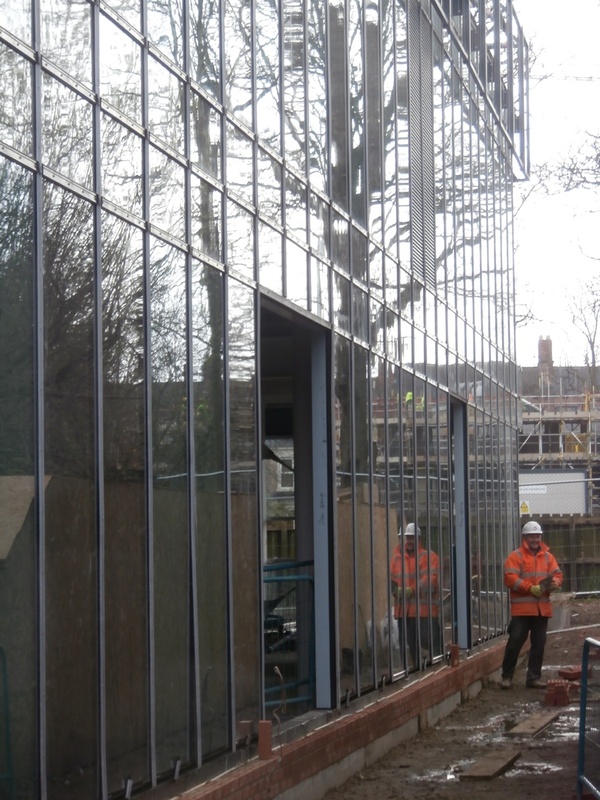 If you can recall the original plans when the Sports Hall was built in 2002, you will have spotted the difference. 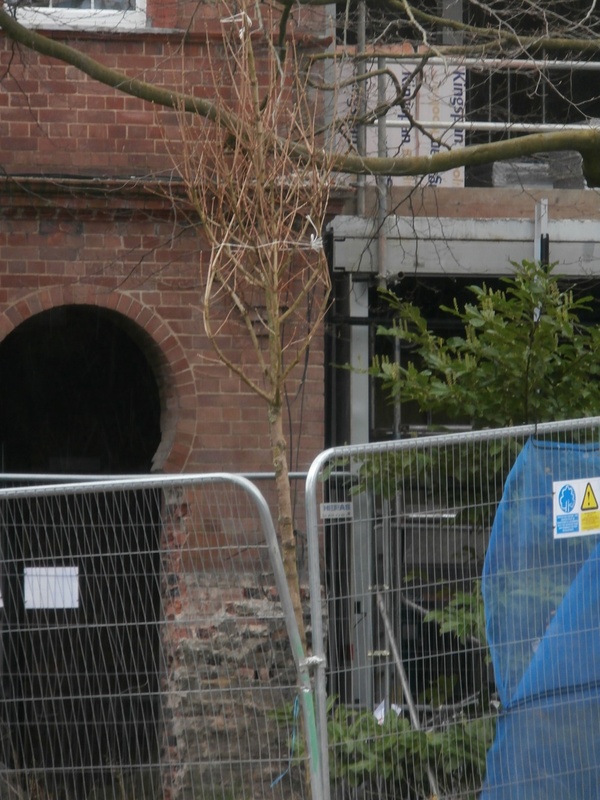 To accommodate the new building’s north-west corner, the angled section of the entrance lobby was demolished and the area sealed off ever since. 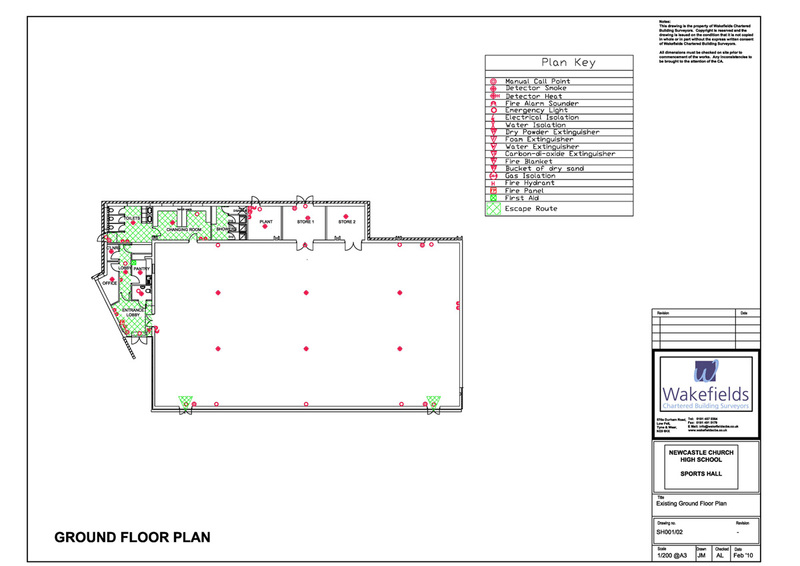 Original Church High fire plans for the Sports Hall & offices. 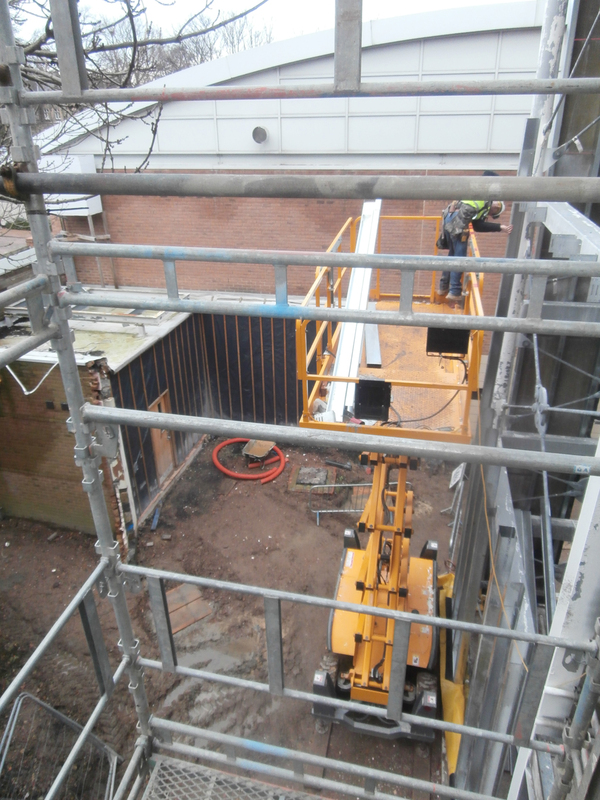 The sealed off Sports Hall entrance lobby area, post-demolition, taken from the new build roof during my January 13th first Site Tour. 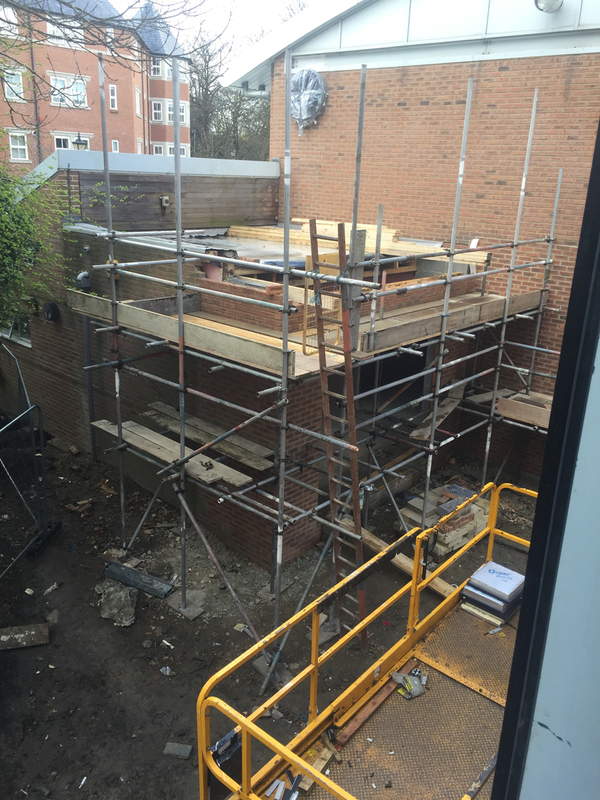 Brickwork now recommencing in this area (Giuseppe.cam). 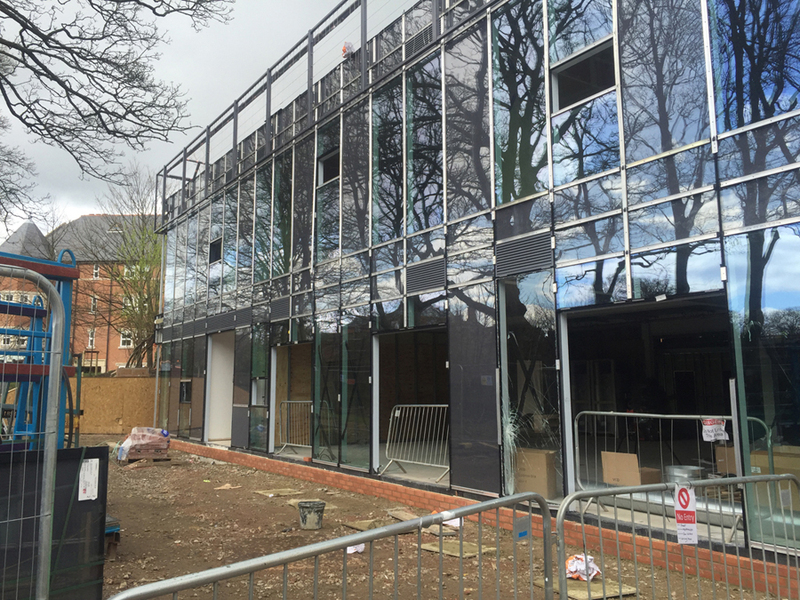 Thanks to photographs taken by Wates themselves and Giuseppe, you can see below how the entrance lobby has been reconfigured. 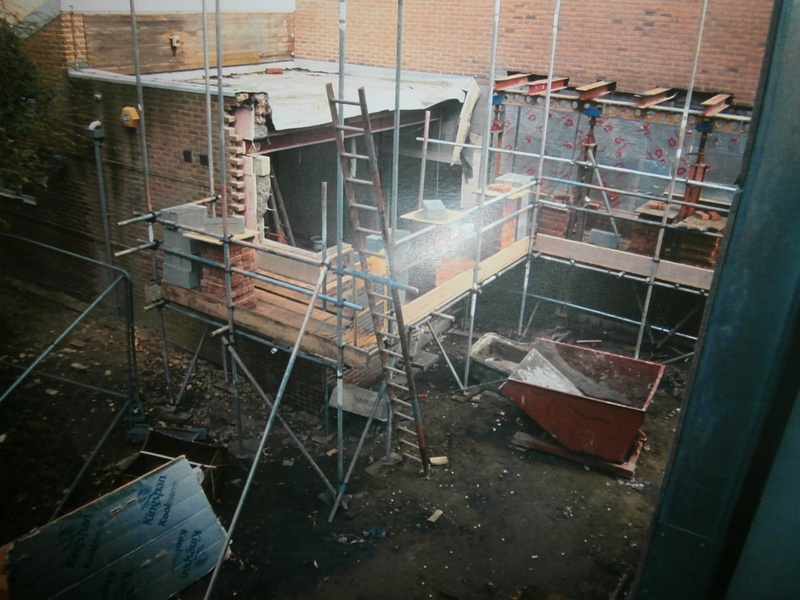 Girders take the weight of the structure while the area of brickwork to the right is matched & replaced (Wates’ Image). 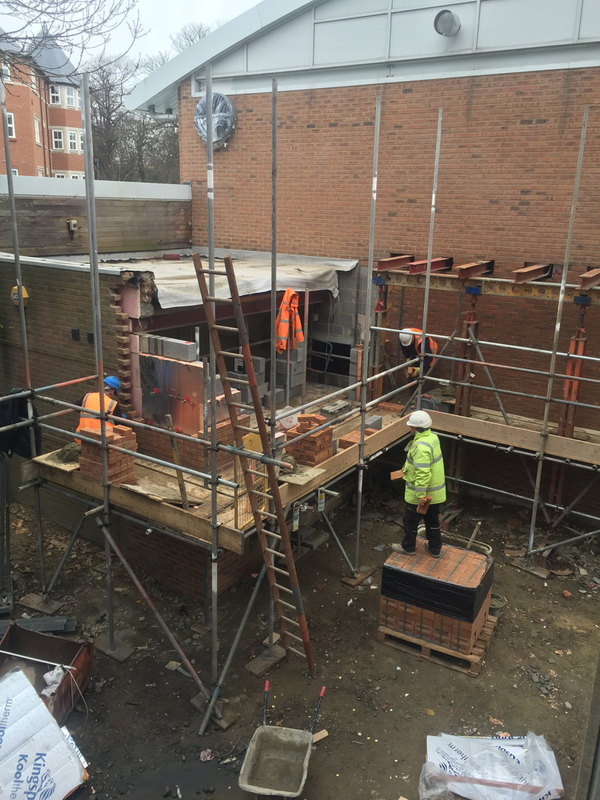 The new brickwork is now complete (G.cam). 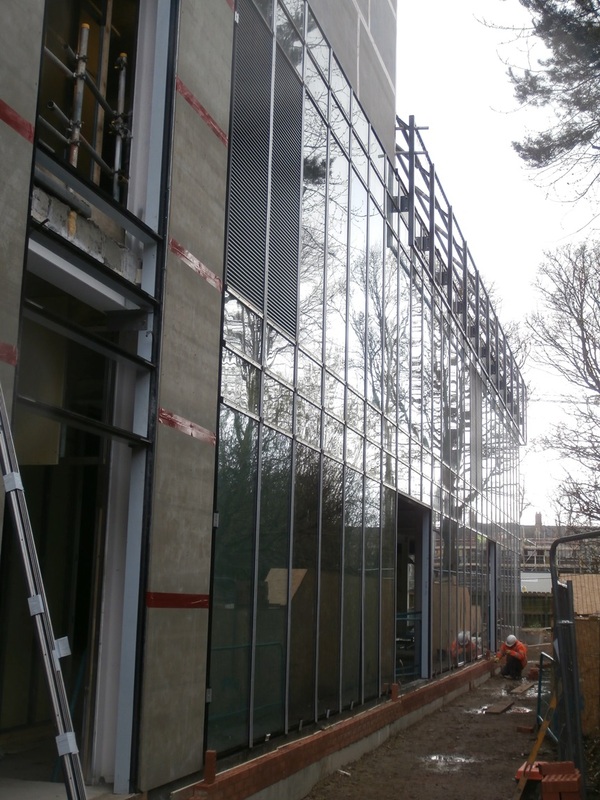 The new frontage is completed next (G.cam). 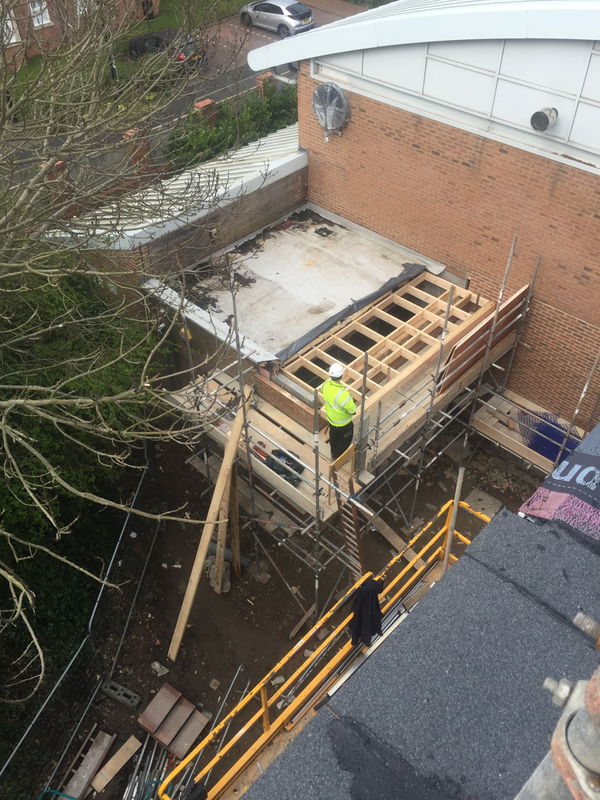 The frame for the roof comes next (G.cam). 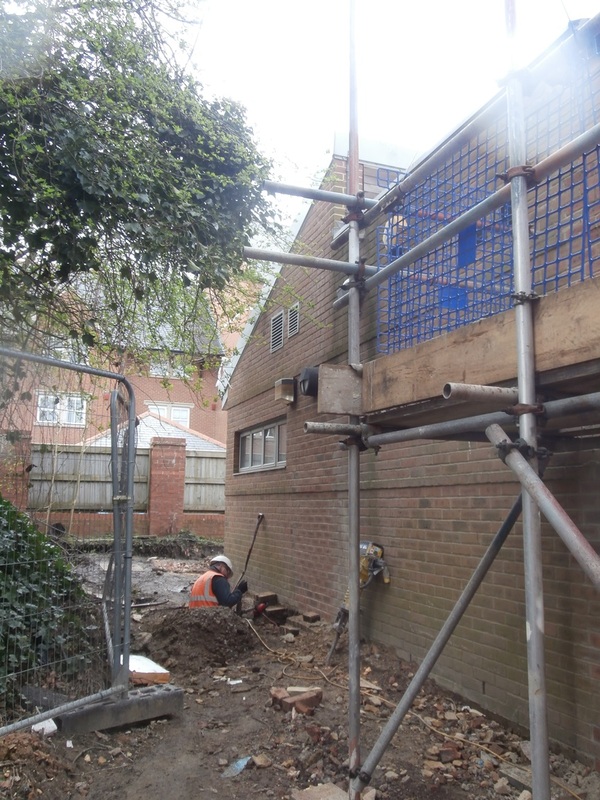 Eddie had told me they were busy creating two wet rooms in the entrance and, as we approached the building, the first thing I saw was someone hard at work in a trench installing new pipes and drains. Drainage for the wet rooms being installed. After ducking under the scaffolding, trying hard not to bang my helmet, I could now see the reshaping of the lobby interior for myself. Inside the reconfigured lobby area facing the new entrance. 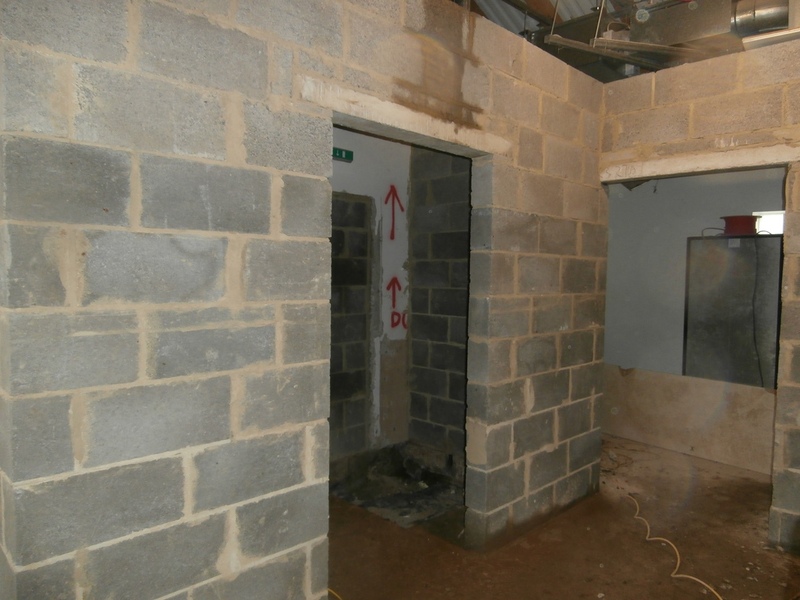 The two new wet rooms are a work in progress at present. 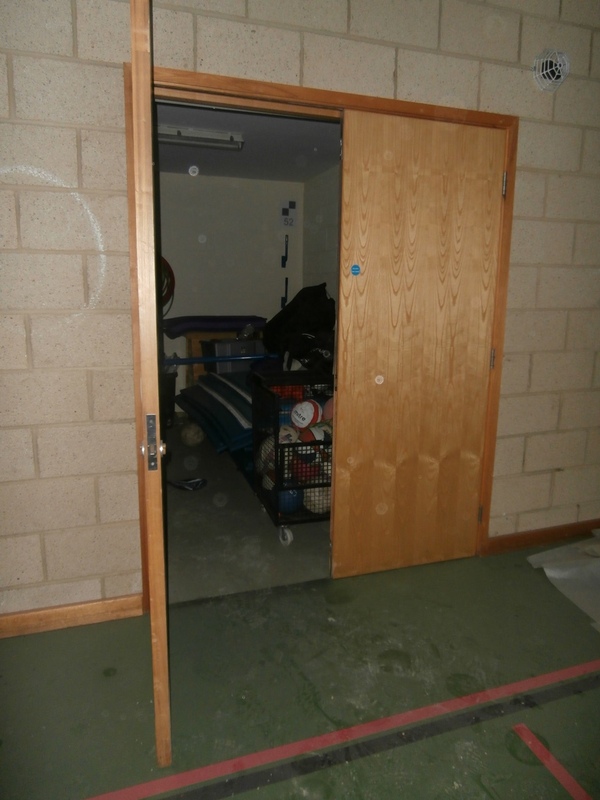 For a full tour through the old toilet & changing room areas and all four corners of the Sports Hall itself as I found them on the 6th April, there is a slideshow at the end of this post. However, the main impressions which struck me were not of sporting achievements, but of entering a time-warp which took me back to the summer of 2014. 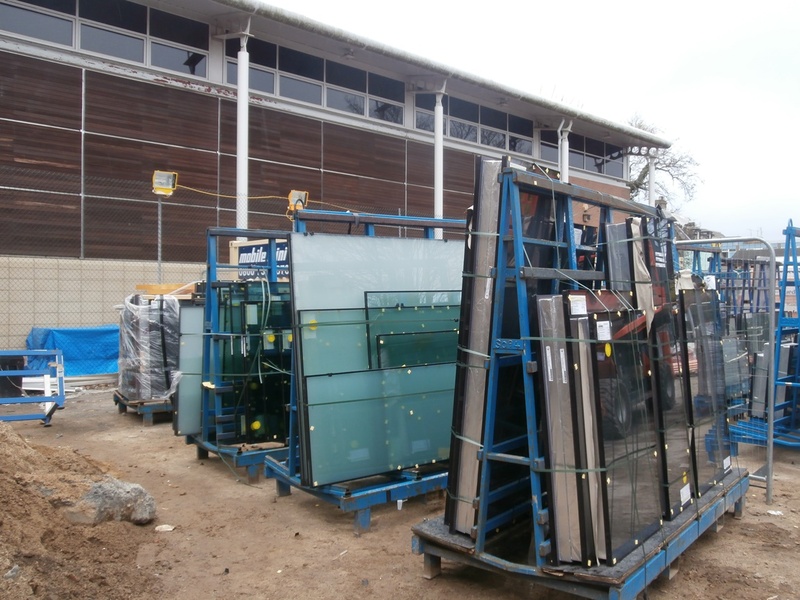 It was strangely disorientating, knowing how much had changed elsewhere on site, to see the store cupboard full of Church High equipment as it had been left. 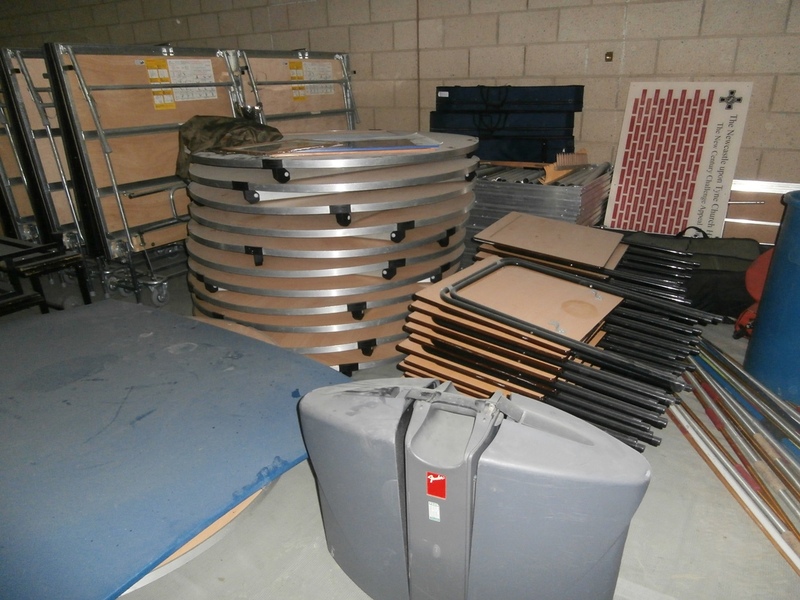 Also the exam desks and particularly the circular Dining Hall tables neatly stacked at the back of the hall. The store cupboard is still full of equipment. The remnants of Church High clustered at the back of the hall. The bright red bricks of the large donors’ plaque which was displayed on the side wall of the entrance lobby caught my eye next. The New Century Challenge Appeal donation bricks plaque. But it was the exam board regulations still in place on the walls and the flipchart showing the Church High centre number & details of the last exam propped up against the wall which affected me most. The exam board regulations are still in place upon the walls. 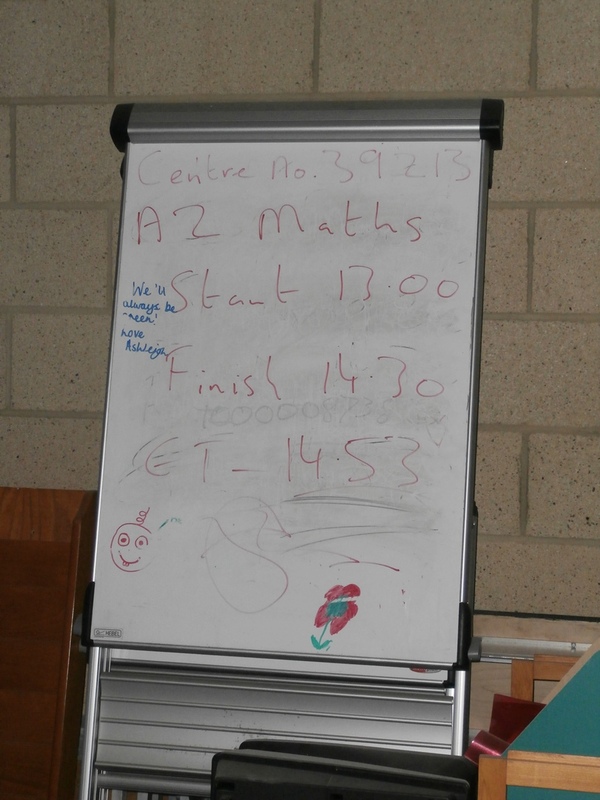 The flipchart still shows the very last exam. However, something even more evocative awaited me in the far corner as we made our way back across the hall towards the door. 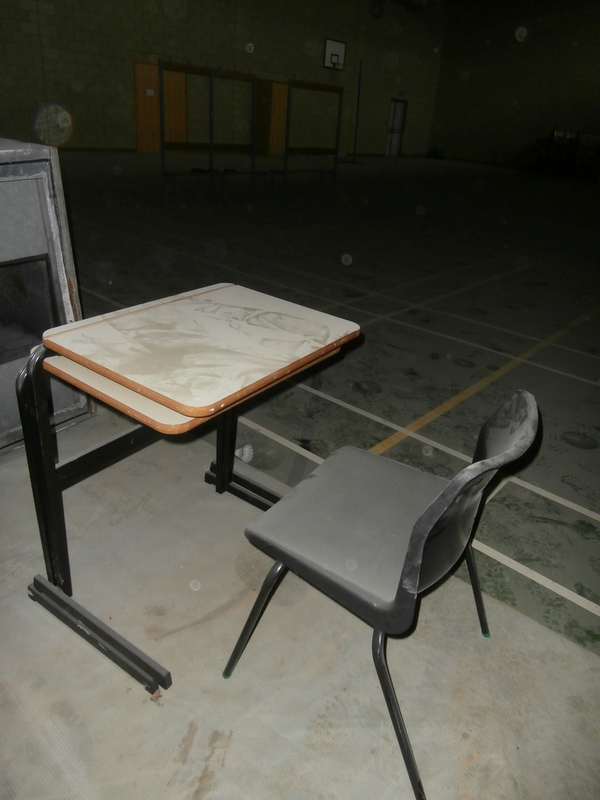 Not only was there a lone exam desk and table still set up next to the central heating units now scattered across the floor, but the clock next to the basketball net on the east wall was still actually working. 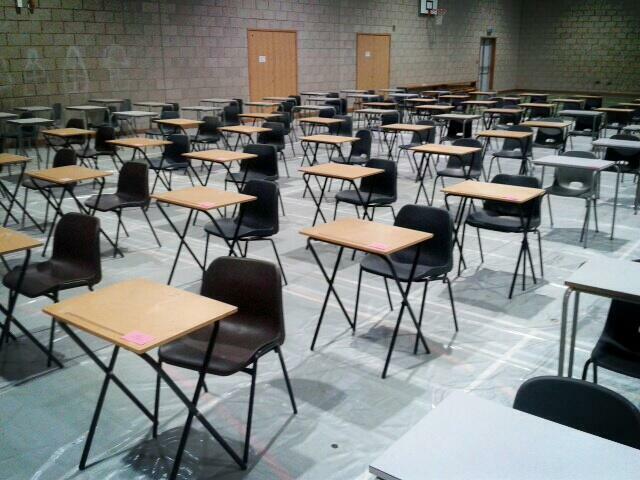 A lone exam desk & chair sit in the far corner. Even now, the Sports Hall is still running on Church High time. 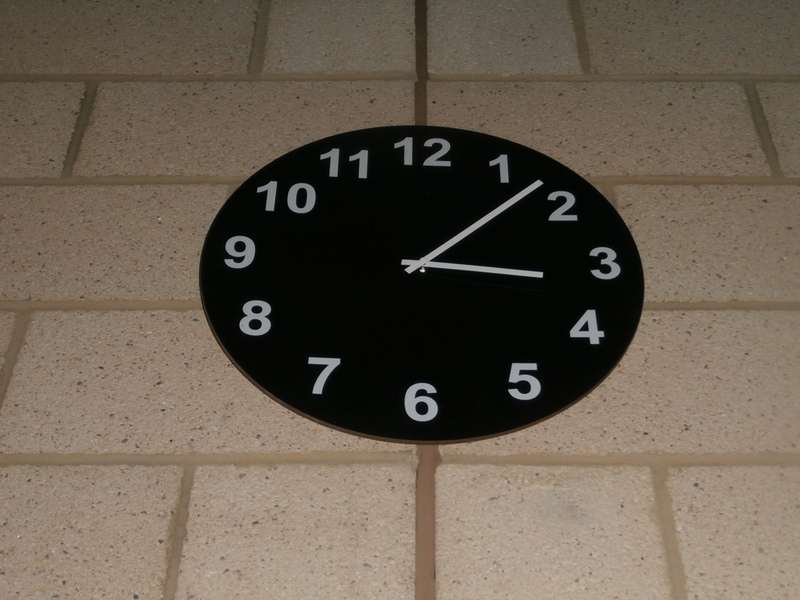 Sports Hall clock: the very last bastion of Church High time. Did you know that in the Chinese language, the word ‘crisis’ is composed of two characters, one representing danger and the other, opportunity? The linguistic truth of this statement may be now open to debate, but John F. Kennedy used it in more than one speech between 1959-1960 and it has often proved very helpful to me. Both at points of crisis in my own life and with my students too. As you know, I’ve felt pressured by being 3 months adrift with the blog, but, in keeping with Kennedy’s trope, the time lapse does have a flip-side. It’s now possible to use Giuseppe Ferrara’s images alongside my own in posts. The advantage for the blog is that ‘G’s’ focus is always on the most recent work, which he records with a far more technical eye than me. 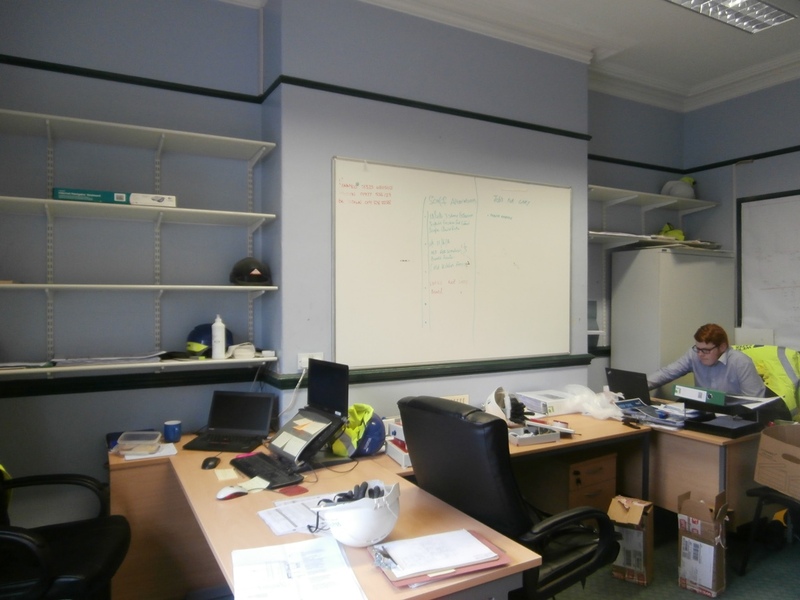 Also, as the client’s Clerk of Works, he not only has daily site access but is also free to go wherever he wishes. 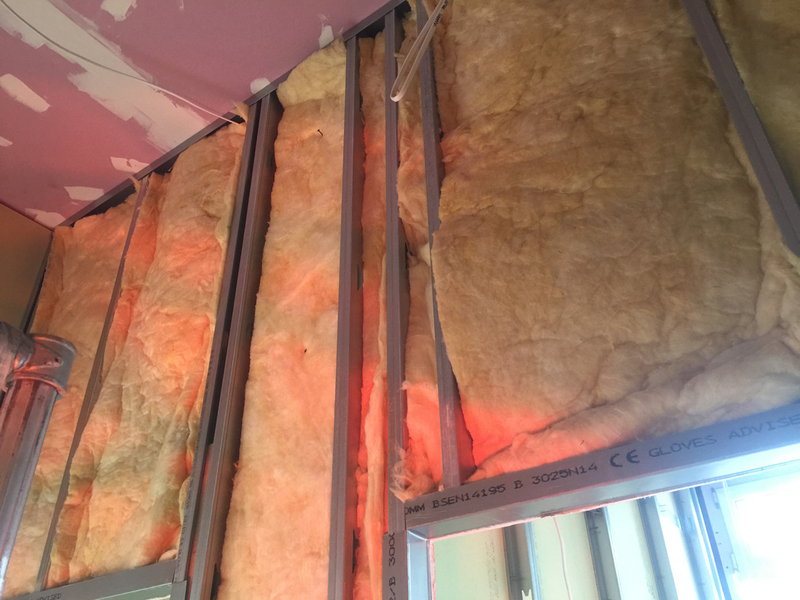 Rockwool insulation within a newly-created stud wall in the old building on March 24th, as photographed by Giuseppe. By now, even I know that all the ‘pink’ board on site is Fire Board. Wednesday March 30th fell within the school holidays, two days after Easter. You may remember the posts I wrote over the Easter weekend focused on the ‘bigger picture’. They also introduced you to Eddie who works for D&L Groundworks. 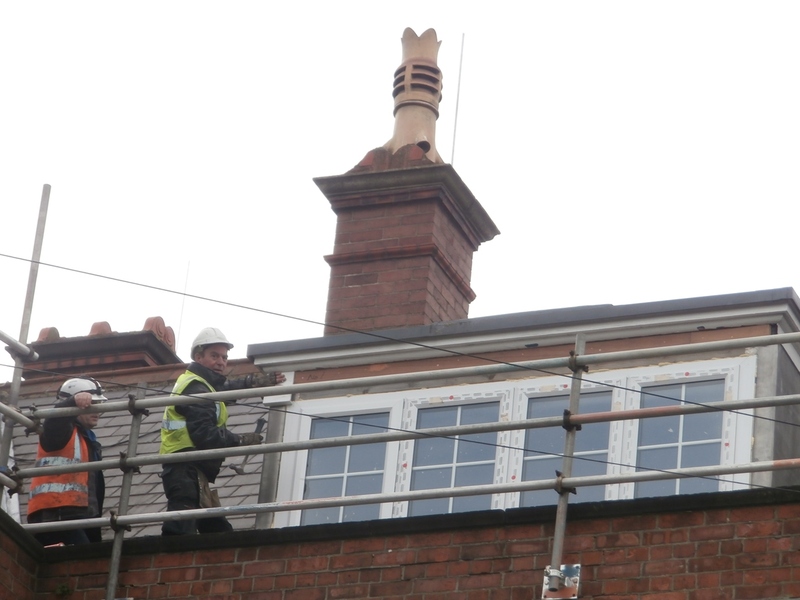 We’ll be saying goodbye to Eddie soon, he tells me, because all the groundwork is nearly done. He’ll probably be back for the finishing off though. 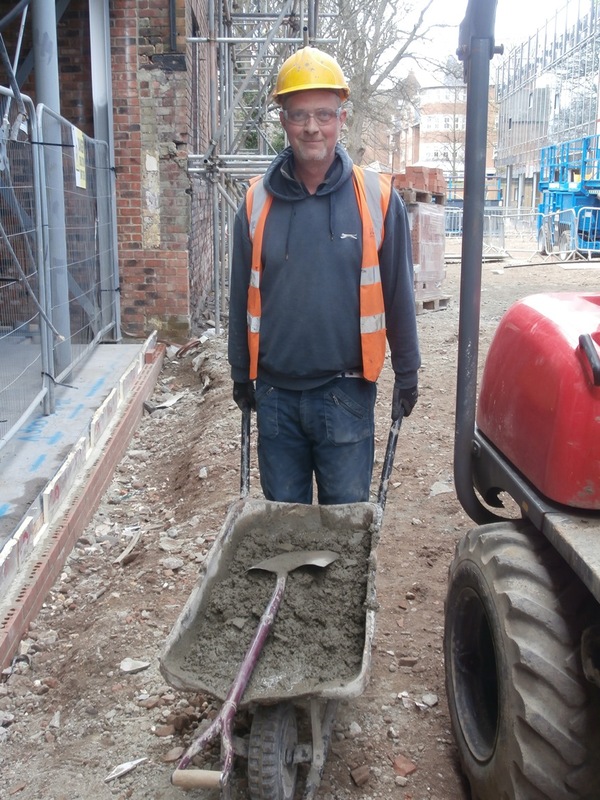 Eddie, D&L Groundworks, busy on site today. Because I wasn’t at work that day, I had more time on my hands than usual. 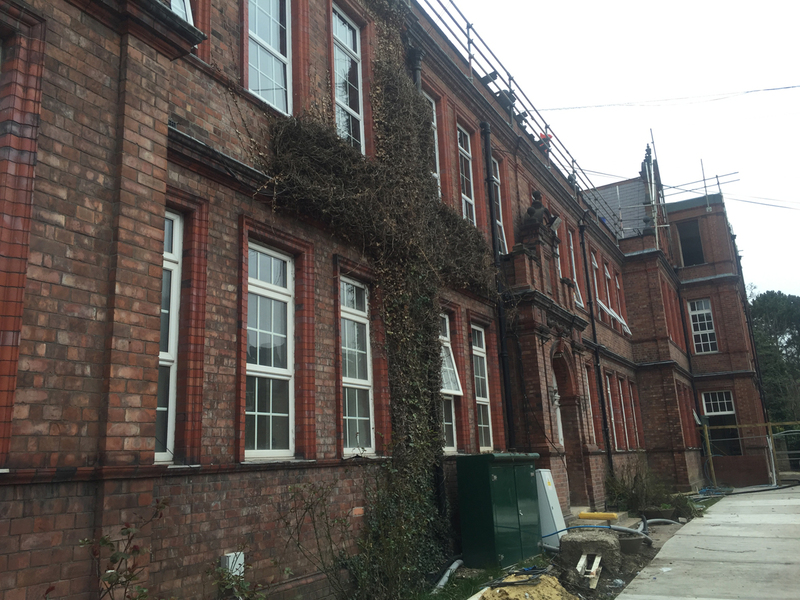 So when Peter asked where I’d like to go, I said the old building – obviously. My impromptu tour only took in the ground and first floors, but was enough to get the feel of how the work was progressing. Also to make clear how well-timed my tour of March 12th had been. 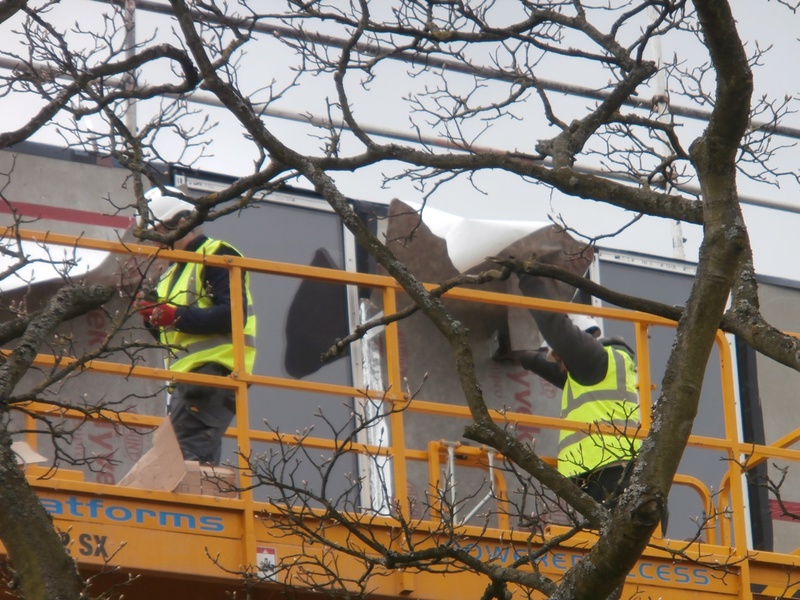 Now there were building materials all over the place. 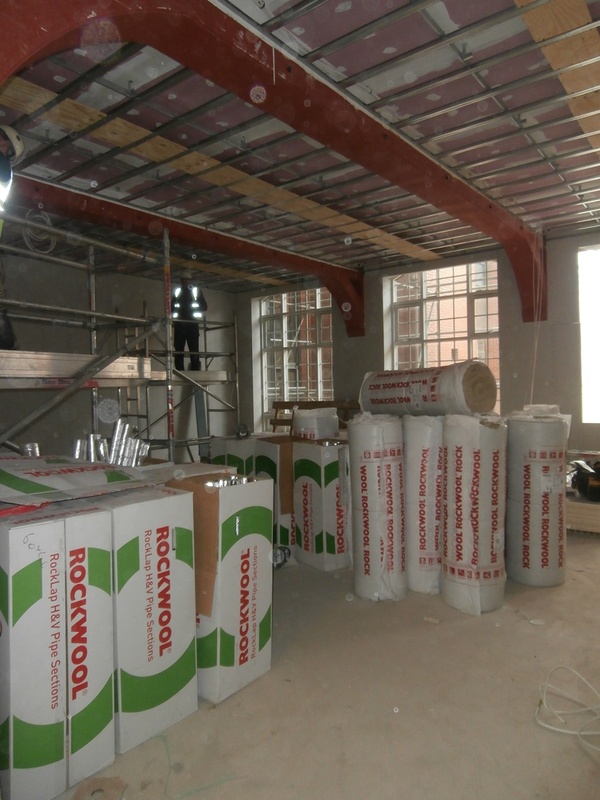 The LRC is full of rolls of Rockwool insulation. 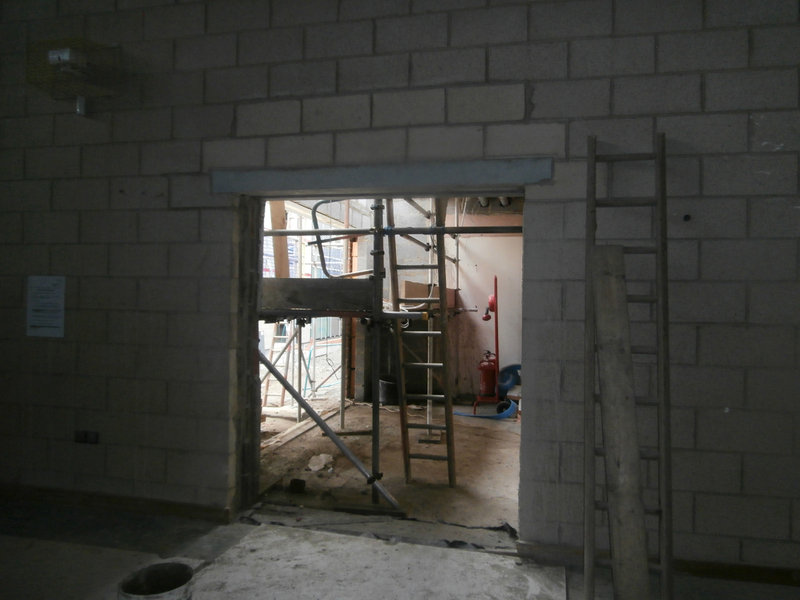 From the moment we entered the old building via the opening in the brick wall of the bin store where the new side door is to be located, it was clear that the main work in hand at the moment was plastering. The whole length of the bottom corridor was now pale terracotta in colour as the skim finish was drying out. It felt like the building was finally starting to warm up, come to life again, after its hibernation. 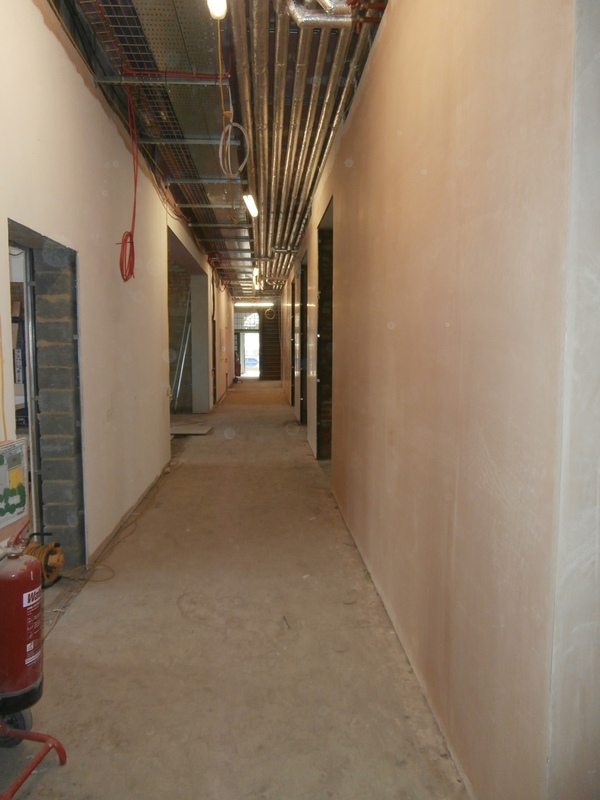 Warm newly-skimmed walls along the bottom corridor looking towards the south pupil door. This feeling of warmth was enhanced by the deep red glow of heat lamps positioned at intervals in order to help the drying out process. 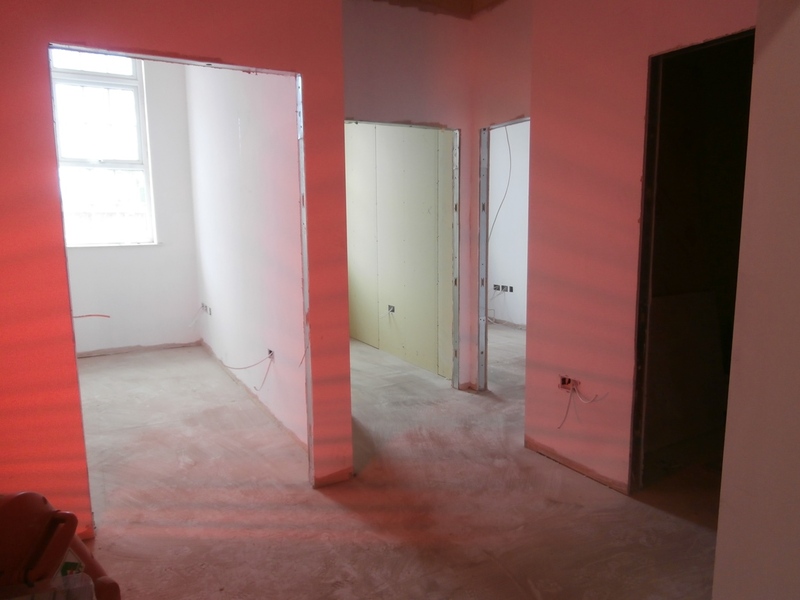 In places, the red light gave an almost neon glow to the plasterboard. 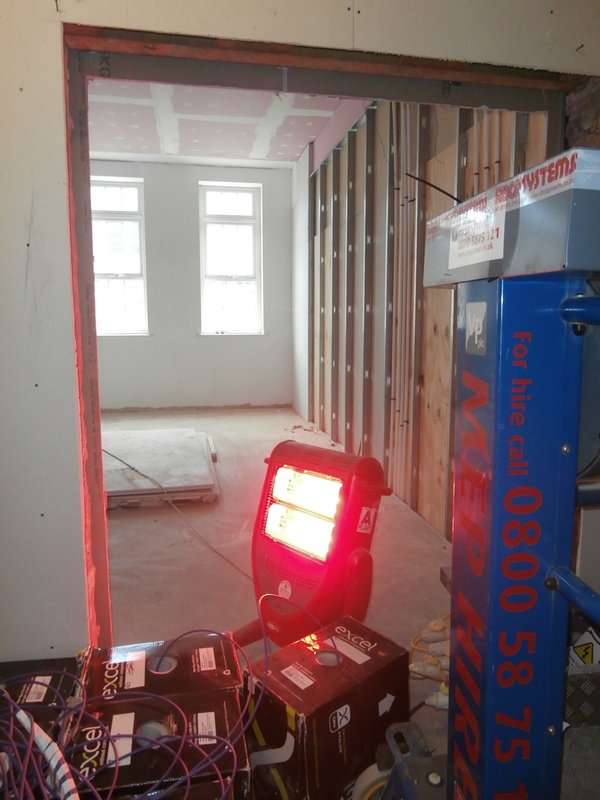 Heat lamps create a lurid red glow in the old Small Dining Room & Pastoral/Nurse’s Rooms. 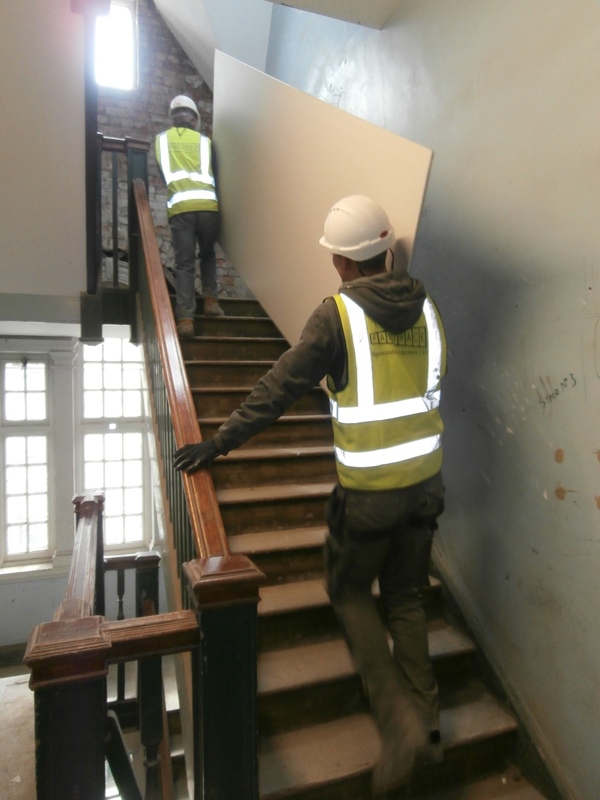 We arrived at the south end of the Main Corridor just in time for me to be able to photograph a huge piece of plasterboard being skilfully manoeuvred up the stairs by two workmen who had clearly done this many times before. As I commented on the high quality of the finish, Peter directed my attention to two men standing talking just behind us. 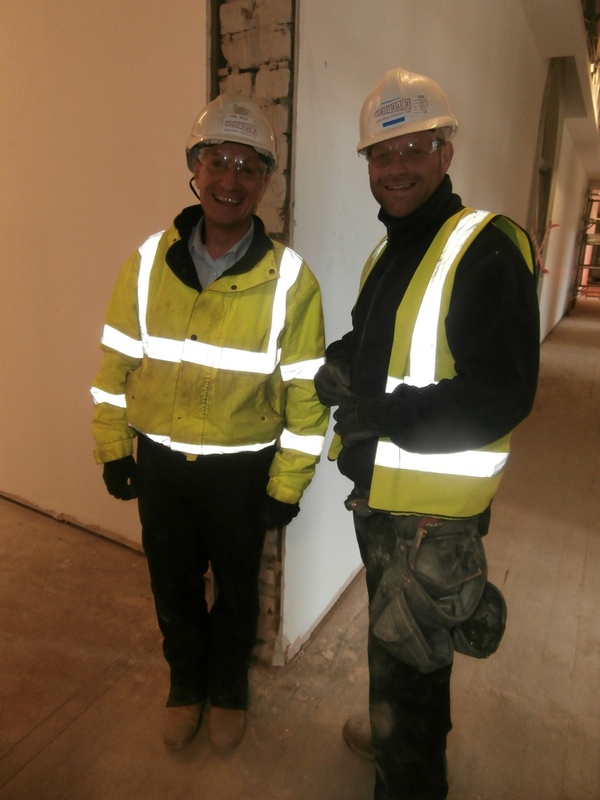 It turned out that the man on the left was the owner of the company who had won the plastering contract for the project. 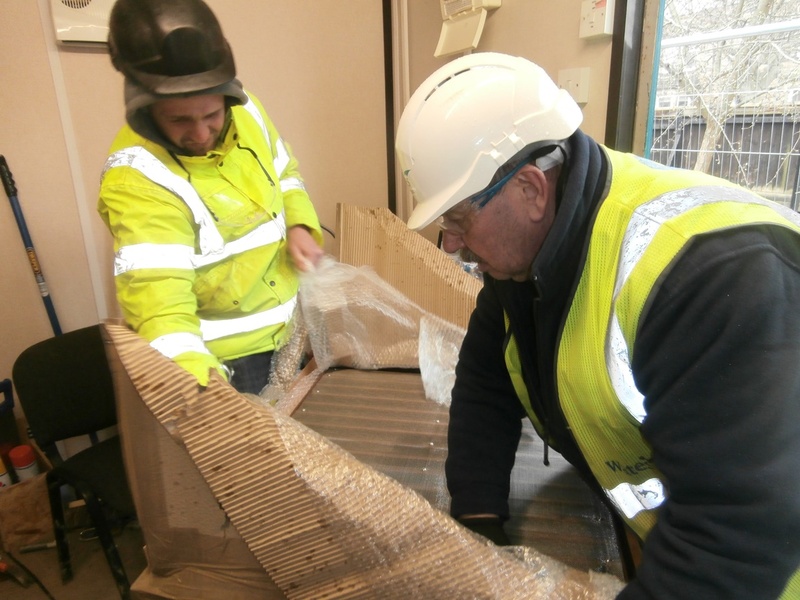 Plasterboard destined for the top floor and a happy-looking plastering contractor (left). 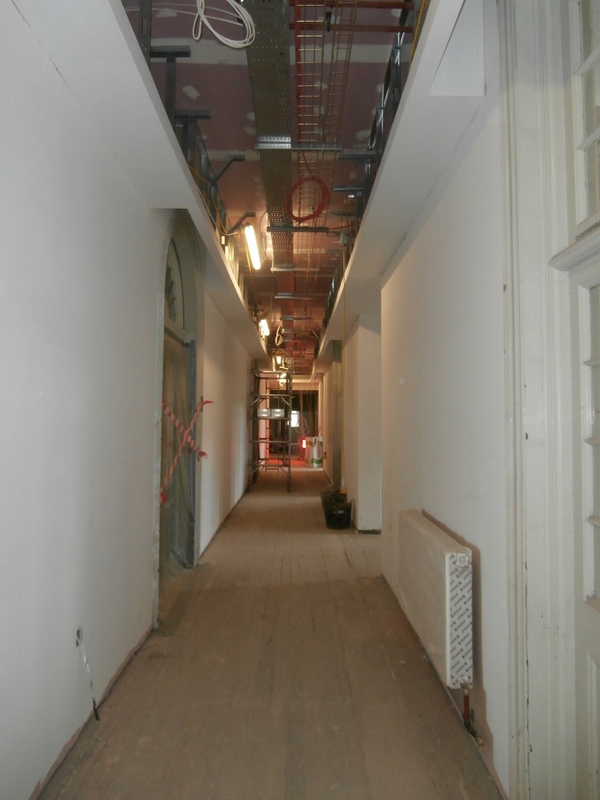 So how was the Main Corridor looking on March 30th? 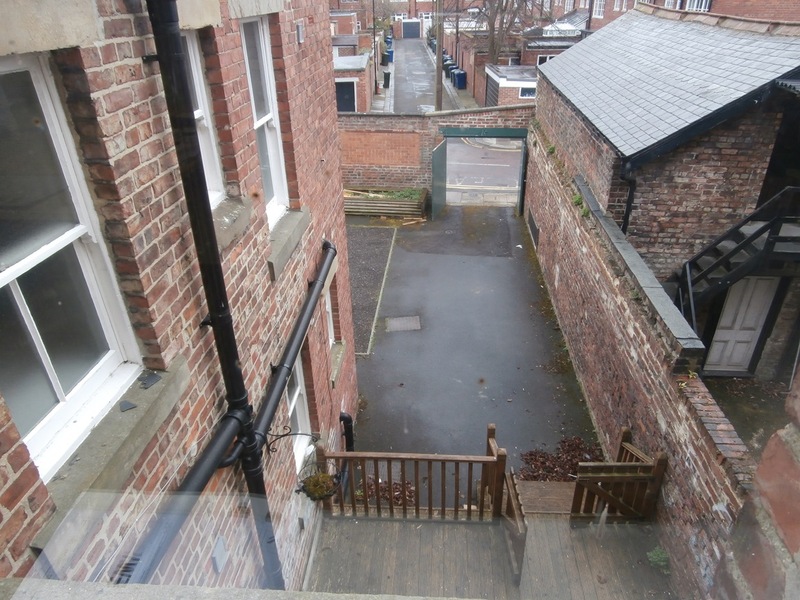 Let’s face it, this is the area of the building which is iconic ‘Church High’ and always will be now thanks to the respect EWA have shown the building. There have been some alterations though. As I said in an earlier post, my teaching classroom (Room 5) has been divided into three, so I will be the last person to ever teach in that particular space. 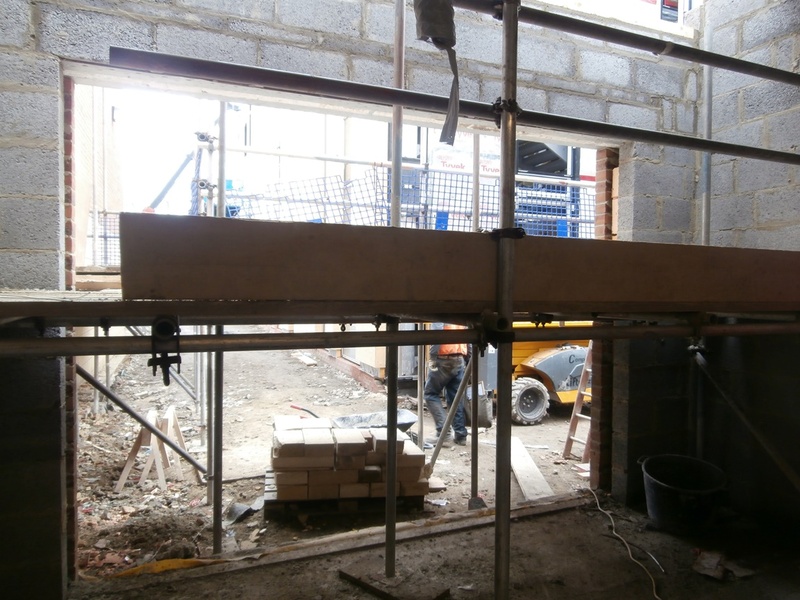 Also, from the picture below, you can see that a radiator has been added and the ceiling has had to be lowered to accommodate all the pipework which building regulations now say must be up-a-height. 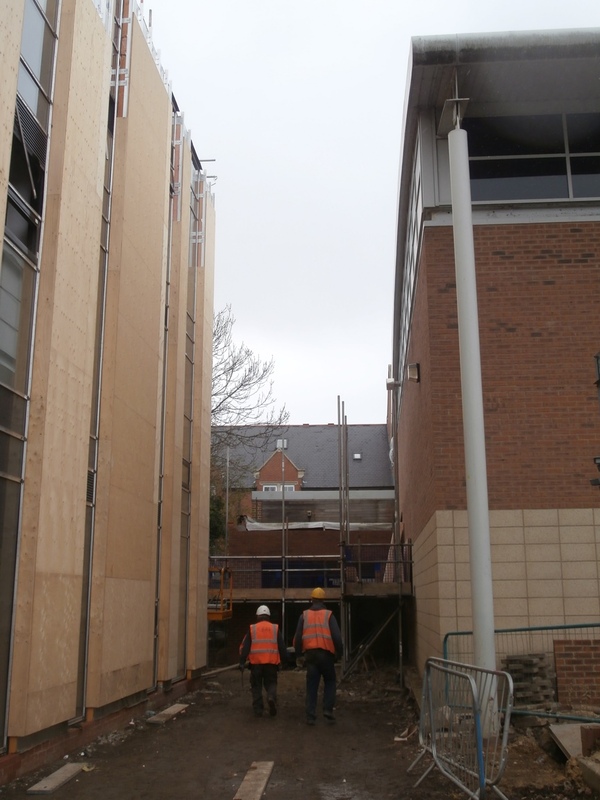 Church High Main Corridor as of March 30th. 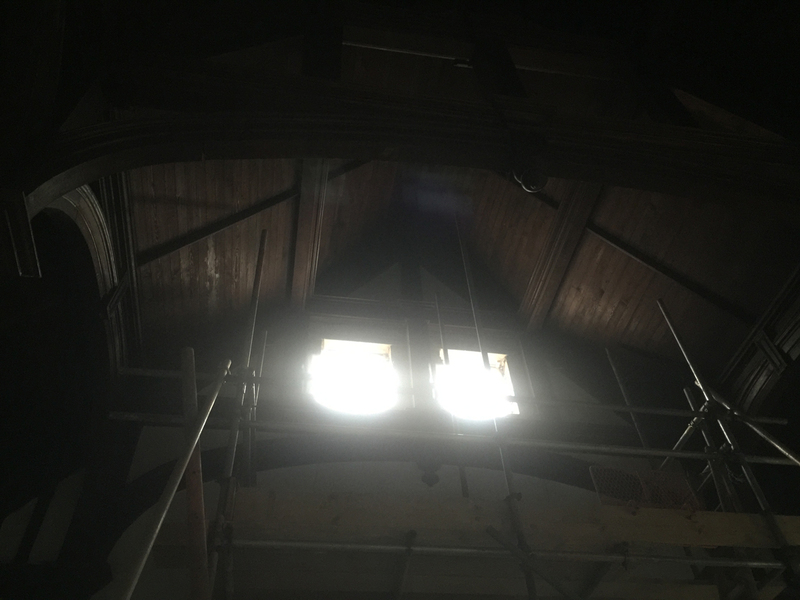 The need to lower the ceiling has had an ‘interesting’ effect on the distinctive semi-circular windows above the Hall entrance doors. 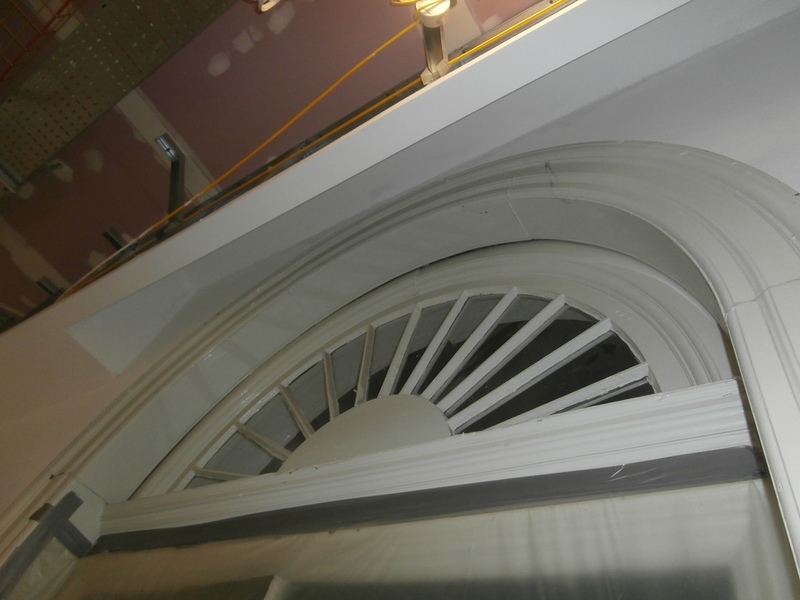 Little alcoves have had to be created to accommodate the very top of the arch, which looks a little odd. Still, you can see they’ve tried. 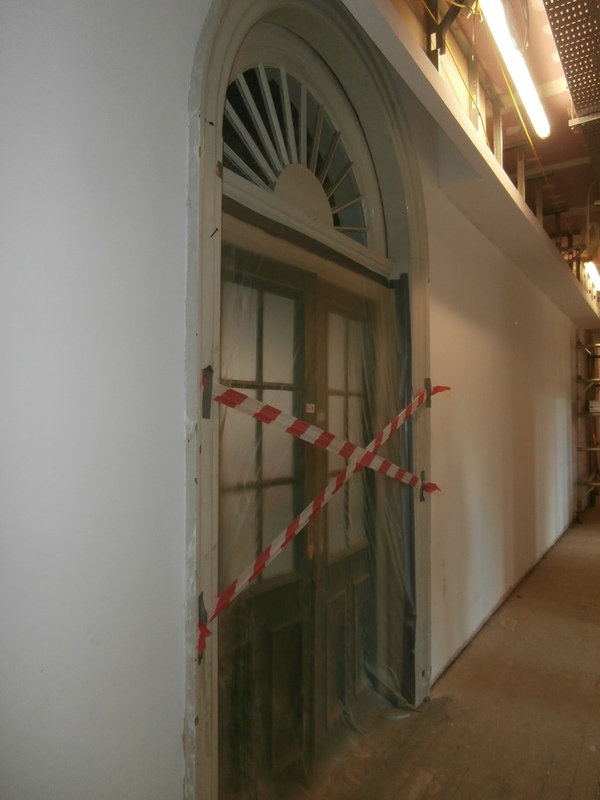 The corridor ceiling is now lower than the Hall door arches. However, it was the south door itself which drew my attention most. Unusually, it was all blocked off with red & white tape. 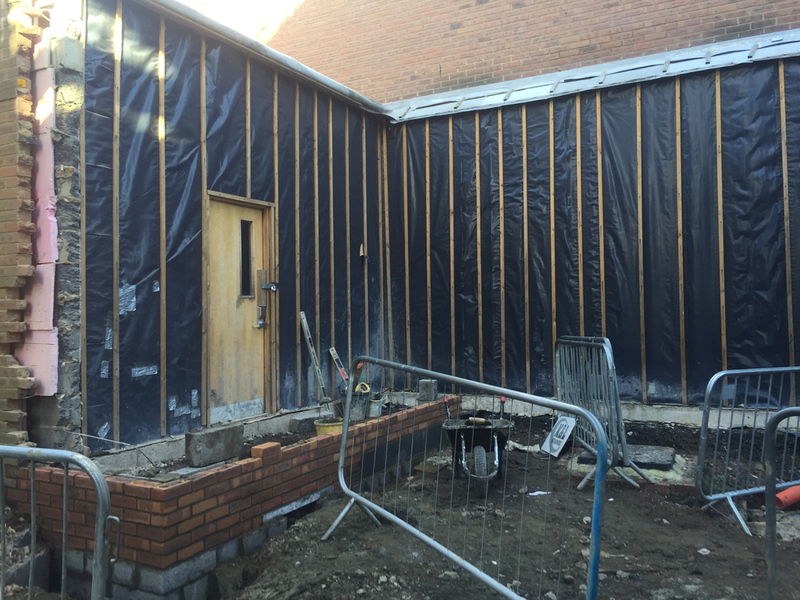 The Hall south door is sealed off with plastic. My heart sank when Peter explained why. 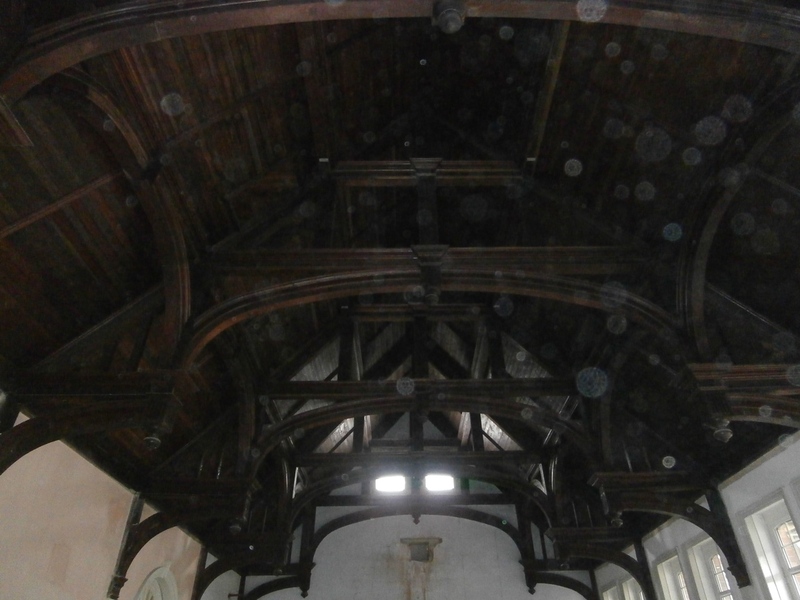 A decision had finally been made about the hammer-beamed ceiling. 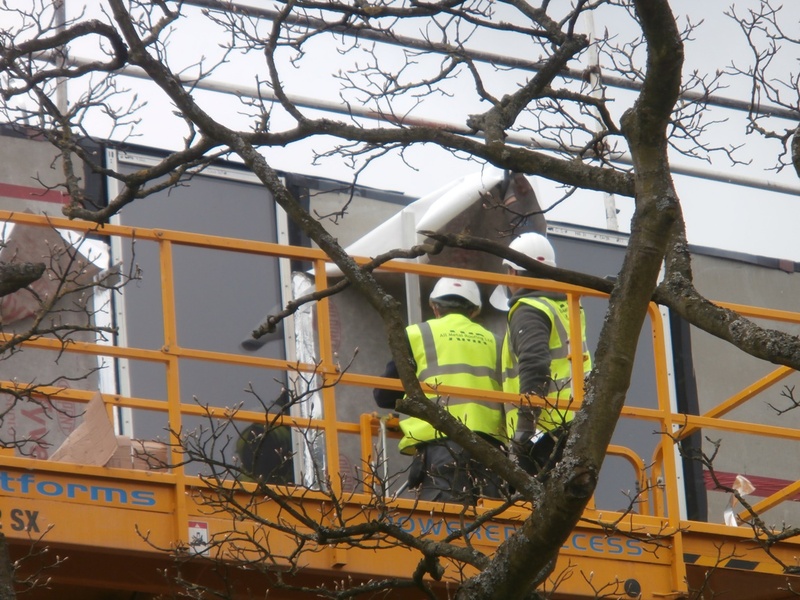 There’d been talk of boxing it off, then of fixing white panels to the spaces between the beams. 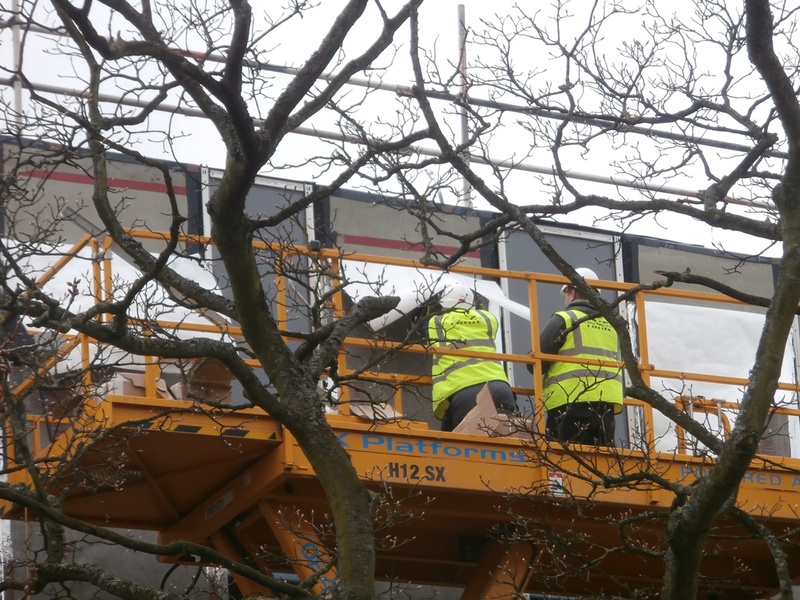 It was now definitely going to be painted white. 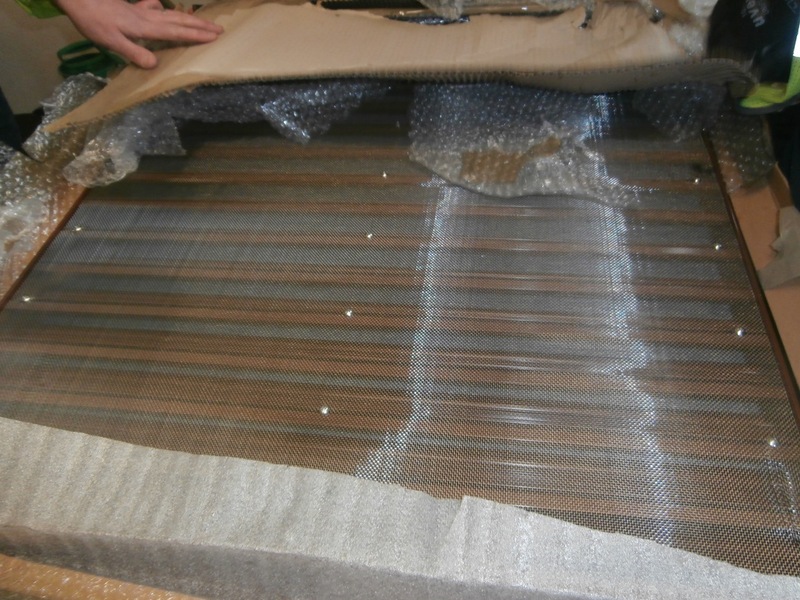 The doors were sealed with plastic because all the moisture had to be removed from the wood before any paint could be applied. I could have cried. Enjoy the beautiful Arts & Crafts dark wood while you can. The wrenching feeling in the pit of my stomach only intensified as we slipped between the plastic sheets of the Hall’s north door. I was greeted by a painfully familiar sight and sound. Dehumidifying units and the noise of heavy-duty fans at both ends of the Hall. Seven months prior to the merger bombshell dropping, my house was flooded on what has become known in the North-East as ‘Thunder Thursday’. I spent a month during the summer of 2012 living with the noise of fan and dehumidifier 24/7 as my house dried out. That’s not something you forget, I promise you. It’s been a tough 4 years. 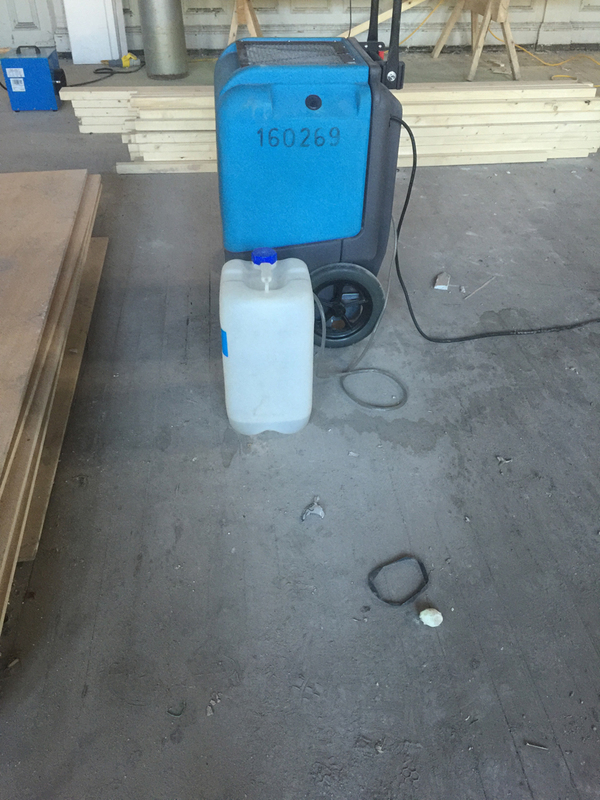 An industrial dehumidifying unit and heavy-duty fan to move the air around are whirring away at both ends of the Hall. If anyone has lived in that kind of environment, you’ll know it gets unbearably hot, so I didn’t envy the carpenter working on the stage. 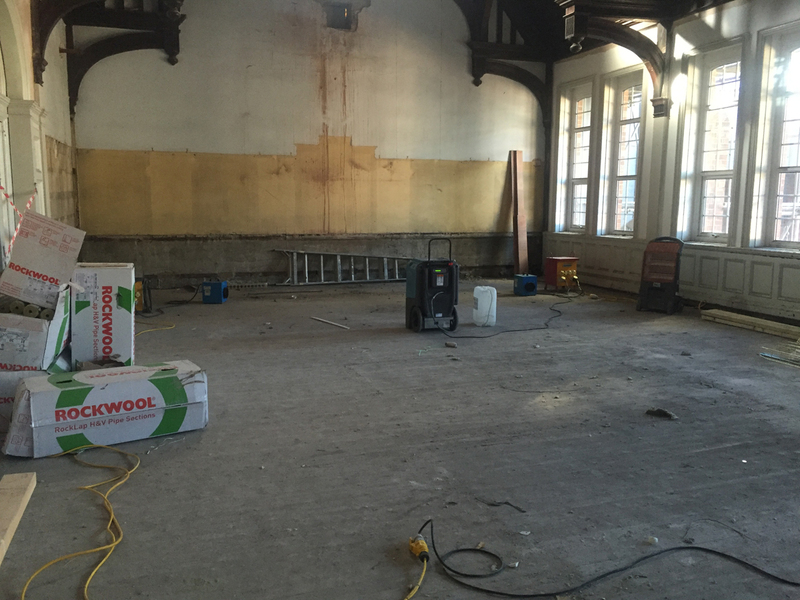 The staging is to be kept and incorporated into the new design for this space which will now become the Sixth Form Common Room. Lucky them! 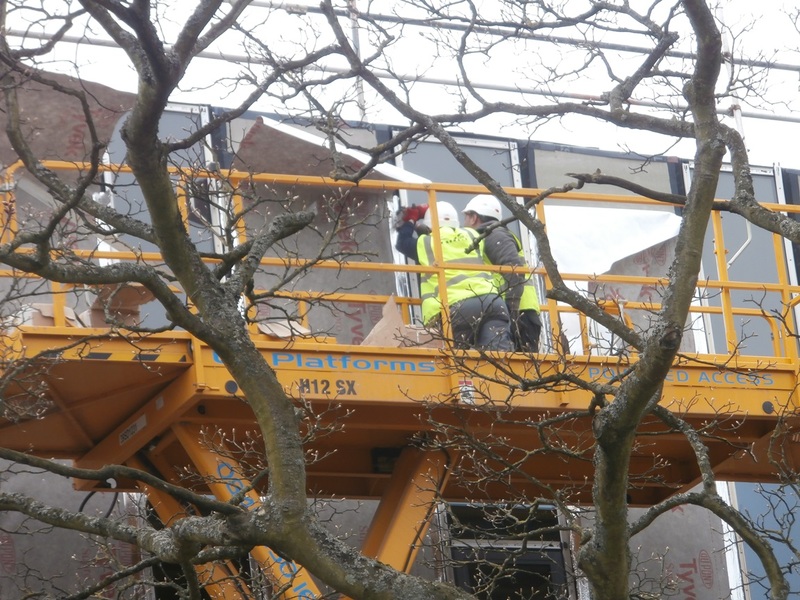 The platform is to be extended at the window side and shaped into an arc. I’m sure the carpenter will make a good job of it. 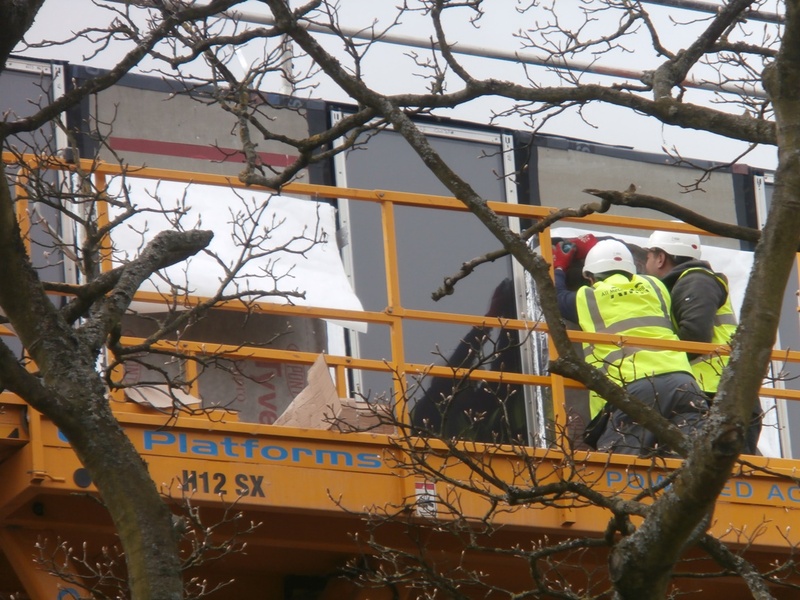 I’ve met this carpenter on site before – more than once. His name is Paul Brown and I’m 100% sure he’ll do a good job of extending the stage, the job he’s busy working on now. 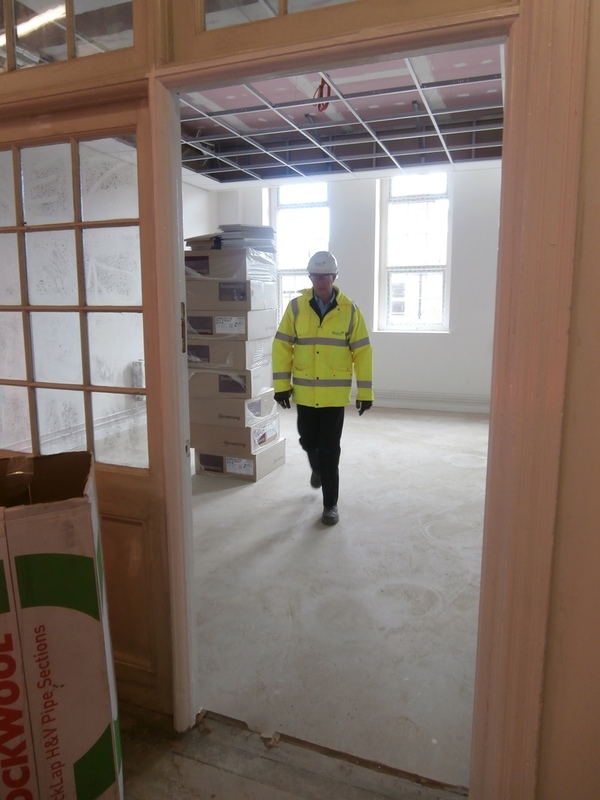 Before my tour came to an end, there was just time to take a quick look at the progress being made in the Main Corridor classrooms. 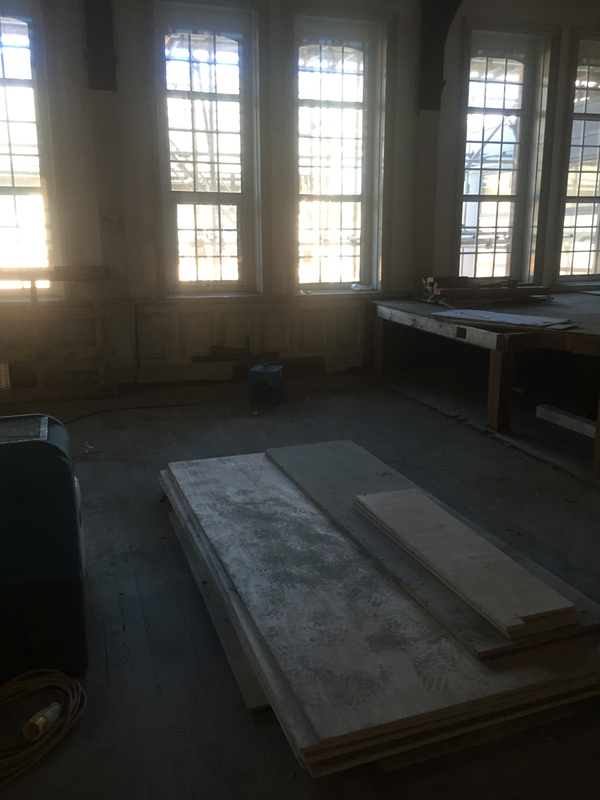 Old Room 3, which most recently served as Laurence Fleck’s English classroom, is being prepared as a ‘Sample Room’ and seems to be coming on well. 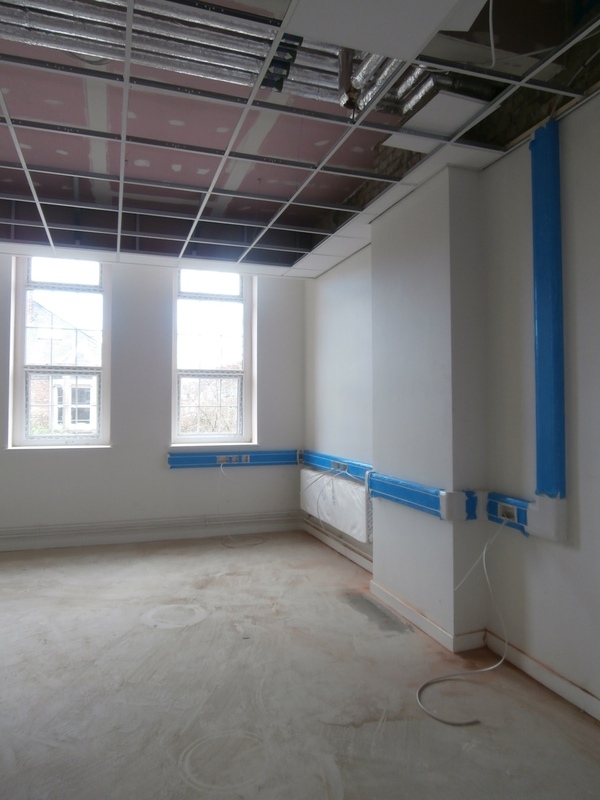 It’s been painted white (of course), the trunking for the state-of-the-art Promethean teaching wall is all in place and the ceiling will soon be finished. 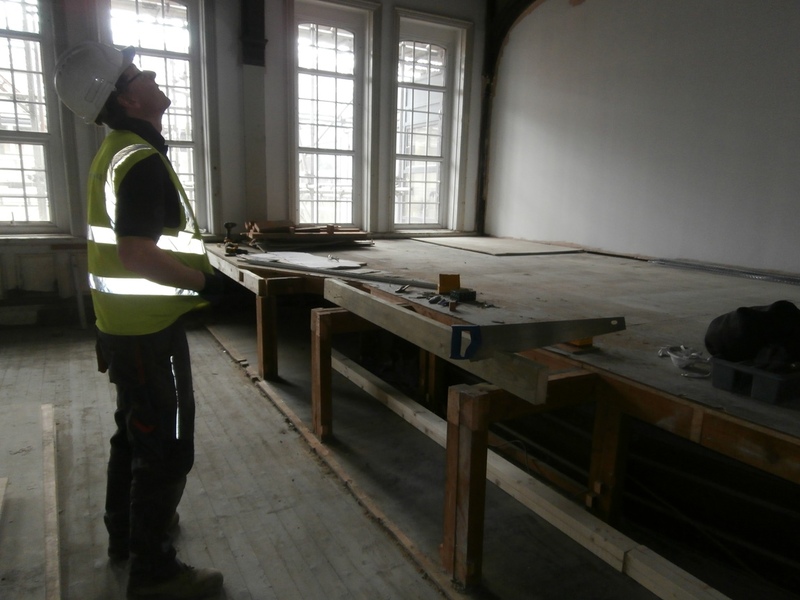 Paul Carmichael, who you’ll hear more of later on in this blog, was inspecting the progress today. Old Room 3, soon to be known as Room 21, is now being prepared as a Sample Room. 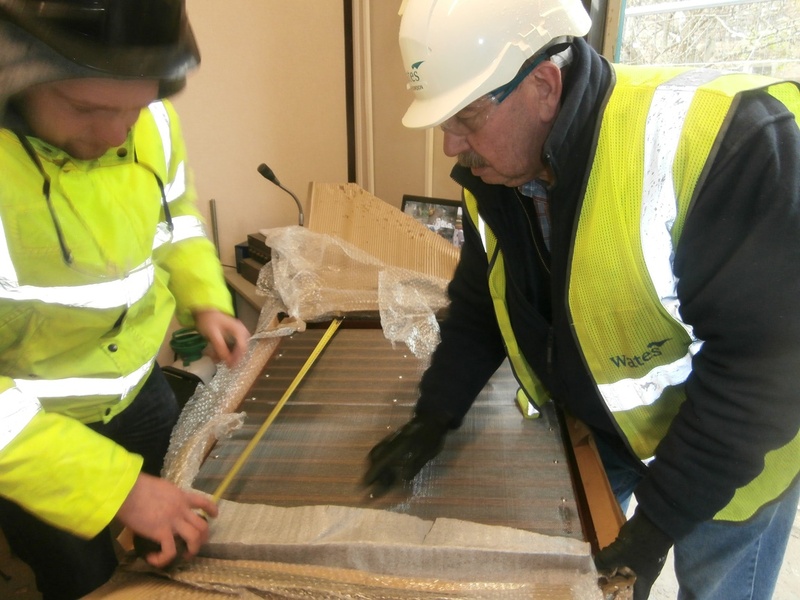 Wates’ Paul Carmichael is checking it today. I can’t leave the building without ‘touching base’ in my old room, even though it’s now three separate rooms. 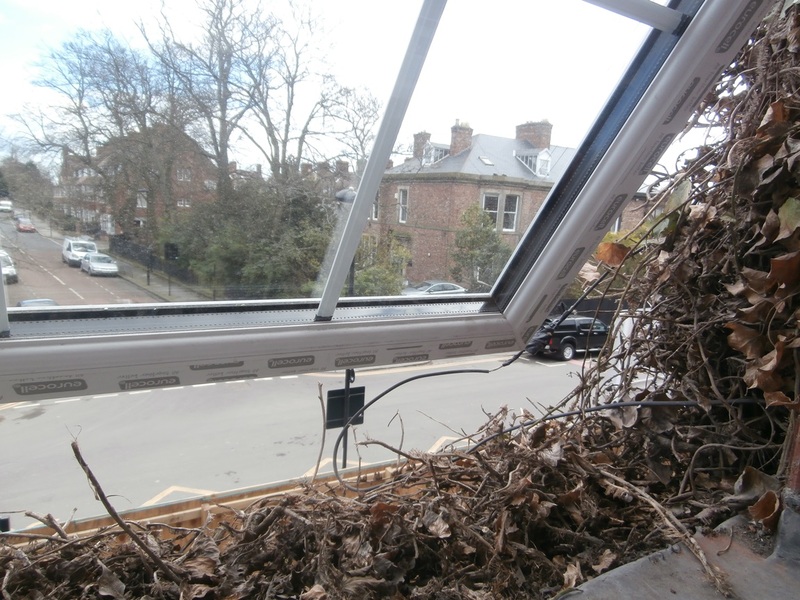 Today the new windows were all open. For the first time ever, because these windows open at the bottom, I could actually touch the ivy cross. 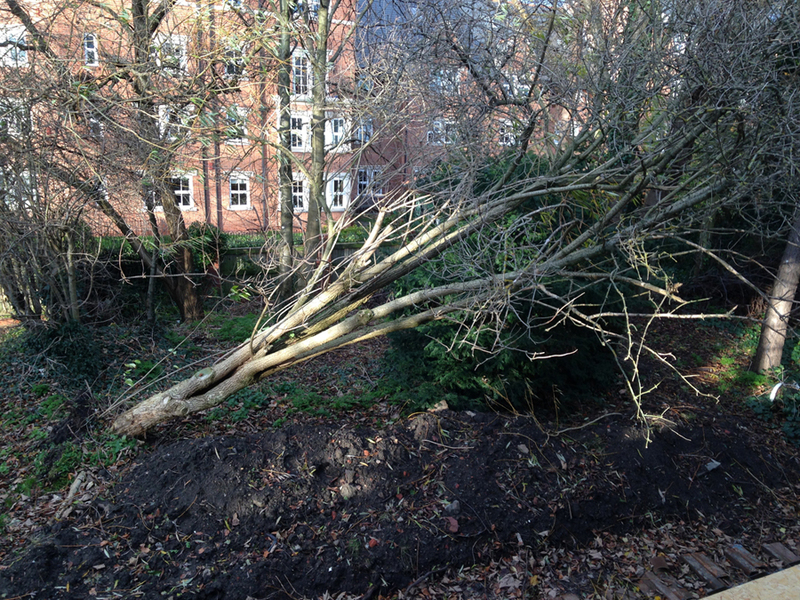 That’s now all dried out too, of course. Some days are much harder than others. For the first time, I can touch the ivy cross outside Room 5.